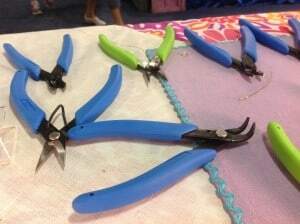 Every chainmaille artist owns at least two different pliers and each has his/her own preference for brand and style. 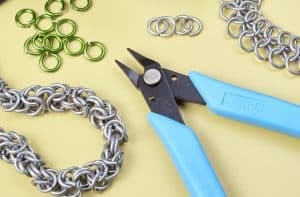 Having had the opportunity to meet with many different artists and designers, we’ve isolated three essential Xuron® brand pliers for chainmaille work. There are a lot of things I like about a trade show but one of the most enjoyable is having the opportunity to meet new people and catch up with old friends. Yes, we’re all there to do business but the importance of the social component cannot be underestimated. We’ve all heard the phrase, “its what’s on the inside that counts”. I’m here to remind you how true this is and the Philadelphia Convention Center is a great example – it’s not pretty on the outside, but inside you find a world of things sparkling, colorful, unique and fun. Wire, wire, wire. 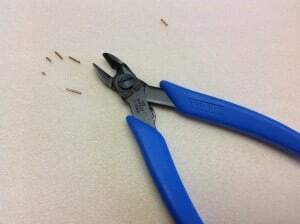 If you love working with wire but don’t love those tiny cut-off bits that litter your workspace, we have just the solution. 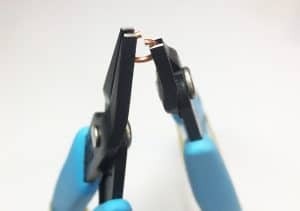 Xuron®’s Model 9100F Oval Head Micro-Shear® Flush Cutter comes equipped with a magic “wire retaining clip” that holds cut-off wire pieces.